Alvin Kamara puts a hand down to steady himself after a tackle attempt, allowing him to evade it and take the ball the rest of the way for what became a 33-yard touchdown reception. Until the Saints beat Tampa Bay 30-10 on Sunday, only two previous teams in NFL history had won six games in a row after losing their first two. Those two teams are the 1993 Dallas Cowboys and 2007 New York Giants. Do you know what else those two teams had in common? They won the Super Bowl. It might be a little too soon to start thinking about those possibilities for the Saints, but after I suggested after the Lions win that the Saints could well be 6-2 at this point, it’s hard not to think about a potential Super Bowl run. The game itself wasn’t particularly interesting– the Saints went in as a sizable favorite against a Buccaneers team many suspect has quit on the season; with Jameis Winston playing through a shoulder injury before giving way to Ryan Fitzpatrick, Tampa Bay never stood much of a chance. The Saints’ defense held Tampa to 200 total yards, while gaining 407. And despite losing the turnover battle once more, the Saints dominated; a punt block and TD from special-teams ace and preseason standout Justin Hardee tipped the scales even more in the Saints’ favor, and the team kept a 30-3 lead until a garbage-time TD drive with under 7 minutes left. Justin Hardee (34) tracks the ball in the air after he blocks Bryan Anger’s punt. Hardee would recover and score a touchdown on the play. Perhaps the most encouraging note from the game isn’t even one of the big offensive performances, like Alvin Kamara’s 152 total yards from scrimmage and two TDs. 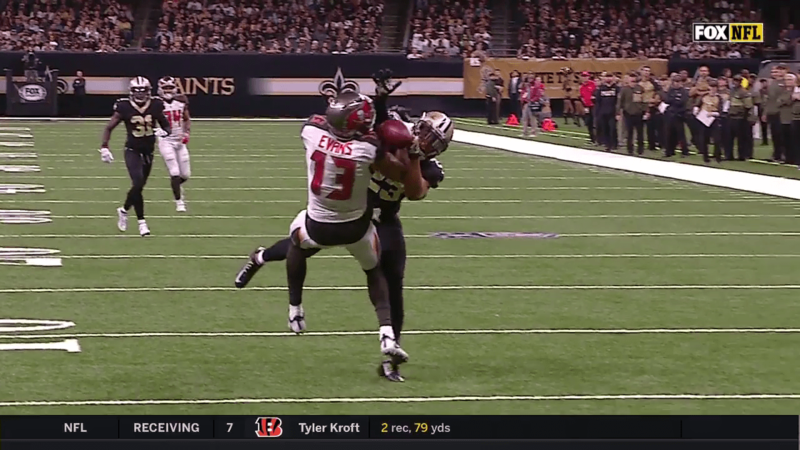 It’s that Marshon Lattimore stepped up once again, holding one of the league’s premier receivers in Mike Evans (who has five inches of height on him to boot) to just one catch for 13 yards– and then frustrating him so much that Evans hit him after a play with a blindside shove in the back, earning a one-game suspension. Lattimore has not only been the league’s top rookie (despite what national analysts who don’t pay much attention to the Saints would tell you), he’s already become one of the top players at his position– and according to Pro Football Focus’ grades, he’s been the third-best player in the league, period, at any position, behind only defensive tackle Aaron Donald and linebacker Bobby Wagner. And after a decade of frustrating drafts, after years of big free-agent contracts that didn’t work, it’s remarkable how much of an impact has been made by the 2017 free-agent class and the 2017 draft class, which is already looking like it’ll compete with 2006 as an all-timer. Lattimore speaks for himself. Ryan Ramczyk and Alvin Kamara have been invaluable offensive additions. Marcus Williams adds range and coverage to a free safety position that was too often burned in the past. Alex Anzalone had been a positive starter at linebacker before re-injuring his shoulder and going to IR. Trey Hendrickson has moved into the rotation as the third defensive end and already made an impact. Though the Adrian Peterson signing didn’t work out (and predictably so– he hasn’t been great in Arizona, but he actually fits the offense there), Ted Ginn, Larry Warford, Alex Okafor, and A.J. Klein have all been positive players, and even Manti Te’o has been solid when he’s on the field. It’s a big change from throwing money at players who end up doing next to nothing, like Jairus Byrd, or handing large contract extensions to players who are then cut or traded, costing huge chunks of dead cap (Jimmy Graham, Junior Galette). Even Coby Fleener last year could fall into this category– he’s been completely invisible this year, and has apparently fallen to third on the tight end depth chart, as Josh Hill and Michael Hoomanawanui have received more snaps than him in each of the last four games. Since the Saints are now eight games through the season, let’s hand out some midseason awards to the team’s best performers. Ryan Ramczyk – This one might be controversial, as Alvin Kamara’s spectacular play certainly makes more highlight reels than Ramczyk. But it all starts up front: If you can’t block anyone, you won’t go anywhere. Ramczyk wasn’t expected to play as a rookie, but injuries first to Terron Armstead and then to Zach Strief forced him into the lineup, and his combination of talent and outstanding pass-blocking technique have allowed him to perform very well at a crucial position with a difficult learning curve for rookies. (The great irony is, the Saints expected to draft linebacker Reuben Foster #32 but were leapfrogged by the 49ers. At the time, missing out on a position of need looked like a disaster; now, it’s difficult to imagine how the line would look if Ramczyk hadn’t been there to shore up the tackle positions.) Kamara is a close second, on pace for 1,300 yards from scrimmage and 10 touchdowns. 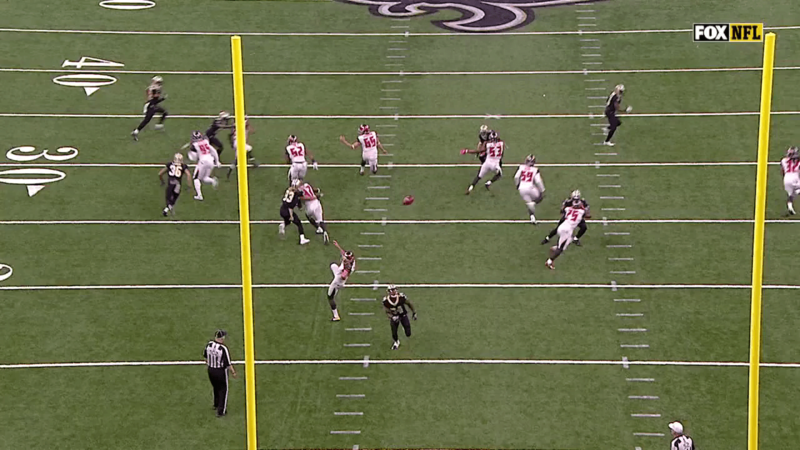 Marshon Lattimore breaks up a deep ball to Mike Evans, part of a terrific day where he held the Bucs star receiver to 1 catch for 13 yards– and drew a penalty that led to Evans’ suspension for week 10. The second half of the season starts Sunday at noon in Buffalo, where the Saints opened as a two-point favorite (currently 2.5 or 3 points by most books). They’ll be missing Kenny Vaccaro due to a groin injury, but are looking at the possibility of having both Terron Armstead and Larry Warford back in the lineup. The Bills expected to rebuild this season, but find themselves at a surprising 5-3 thanks to a defense that’s performing terrifically despite losing several big-name talents. It’s one of three road games the Saints have remaining against solid teams. Clearing that hurdle would put the team in great shape to chase down a first-round bye.